Foodies wanting to try out world cuisine, we’ve got news for you! Bites Beyond Borders in Himayathnagar will take your taste buds for a ride. Bites Beyond Borders brings dishes from across borders into a tiny but admirable space. Between the chaos of this area, keep an eye out for Bites Beyond Borders which is right across TVS showroom. Two passionate food-lovers (Adnan Hashim and Sandeep Jeganath) ditched Chartered Accountancy to start this venture. With an Instagrammable world map on one wall, hanging lights, and various seating options to accommodate 12 people, this place has a very contemporary vibe. There’s high seating available too, and a small waiting area on the outside. An interestingly designed menu offers even more interesting options for a three-course meal. Consisting of a major lot of continental dishes, you can find stuff like Jalapeno Cottage Cheese Balls, Great Buffalo Wild Wings, Mozambique Peri Peri Fries and more to pick for an appetiser. We personally tried their best selling Canadian Poutine Fries and oh, they were such a treat! 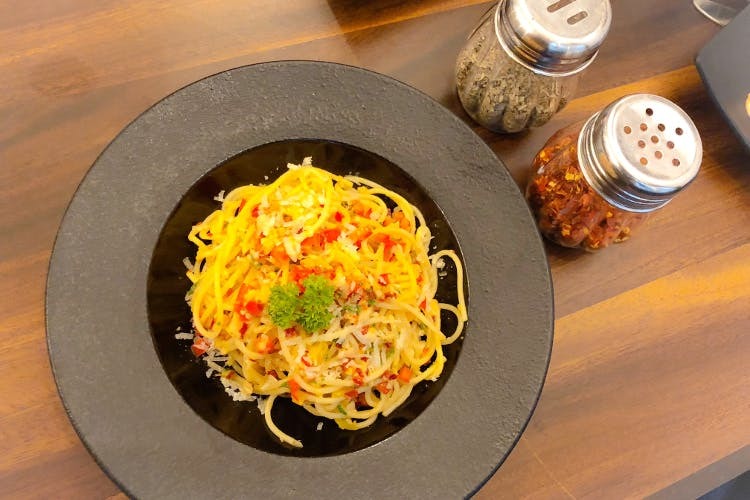 Although they do have burgers (like Boston’s Barbeque Chicken Burger, and Orlando Grilled Burger, amongst others) and thin crust pizzas ranging from a classic Margarita to The Lamber Jack; we hogged on some Aglio E Olio. Might we add, Non-vegetarians, go for the Spaghetti Parmesan, as it is apparently the best? For desserts, take your pick whether it’s milkshakes that you like or waffles. Slurp from a cup of Peanut Banana Heaven or their Snicker Shake. Better still – choose from their four types of Hong Kong Bubble Waffles. We loved our Thunderstruck made from chocolate vanilla and brownie in a mug! This place really does have a lot of options that you wouldn’t otherwise find in Hyderabad and some that the city cannot get enough of. Shawarma lovers, we’re looking at you. This place has got some lip-smacking shawarma, and we hear folks have been going gaga and getting here to satisfy late night cravings too.